Royal blue 6.1 oz. 100% cotton Hanes Tagless T-shirt with I Am PTA word cloud design. 100% cotton t-shirt in vintage navy blue heather, with inspirational quotes screen printed the front. 7.5-ounce, 100% polyester microfleece wit 1/4 zip front. Open cuffs and hemmed thumbholes to keep hands warm. 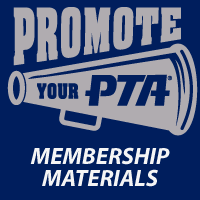 PTA Logo embroidered on left chest. Lightweight and super soft full zip hoodie with silver rhinestud PTA on left chest. Orange, 100% cotton t-shirt with PTA logo on front screenprint on front and the hashtags #Enough and #EndGunViolence on back.